Psionic, electric, sentient, technicolor, giant space weasels! Someone had to create them, and ending up with their creator as my 'Real Life' housemate, they were bound to end up invading my own long standing Traveller universe as NPC's and player characters once we worked out their origins, history, etc. 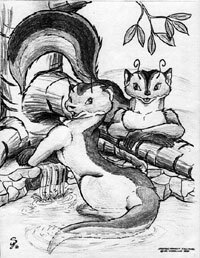 Though the current story's become a somewhat intermittently roleplayed event, world building, sci-fi and sociological speculation, even in-character discussions still break out around the house about once every few days or so, so we're aware of the presence of these creatures. Heck, even the very house I live in is named "The Prancing Skiltaire", with its own lighted street sign and everything (including a reputation that far outstrips the reality, both good and bad). The bulk of material on these pages was created for use in my Traveller campaign, set in the Foreven sector just spinward of the Spinward Marches, and was inspired by my mate's long standing (with some of his original artwork dating back to 1977) association with these odd, if charming, little sentients. Information on these pages comes in a variety of formats, sources, and creative juices. Please bear with me as I get things a bit more organized and get more material up. Since this is mostly in reference to my Traveller campaign in Foreven sector, ship designs will use Megatraveller formats -or- have a very general description to aide others in designing the stats for all the other variant rules (and even game systems) out there. Use your best judgement on cascade skills in character generation, as I allowed a broad mixture of T4 and Megatraveller skills, while favoring the latter's Task System over the former for resolving skill rolls. Dates, when not mentioned otherwise, will generally be at the beginning of the 3rd Imperium's 12'th century, during the last years building up to the 5th Frontier War. For sake of ease of reference to other materials, Imperial dates are used, and the Skiltaire articles, where appropriate, will be in Anglic. While the Skiltaire of my universe are nominally better friends with the Zhodani than with the Imperium, they're walking the fine line of neutrality and trying for the first time, with some difficulty, to befriend the Imperium as well as the myriad neutral worlds in their immediate vicinity. While not expansionistic in mindset, Kunitsa, Foreven's Skiltaire homeworld, is on the verge of trying its hands (paws?) at forging a neutral interstellar confederation to prevent the two giants, Consulate and Imperium, from fighting their next war in the Skiltaire's backyard. Future events described in these pages will generally follow the Traveller timeline proposed by GURPS Traveller (ie no rebellion, no virus, no regency, etc. ), though some parallels may crop up. Overview and History of Kunitsa - Background of the Skiltaire in Foreven. Skiltaire Character Generation - Including rules for the Techempathy psionic discipline. All About Skiltaire - A general overview of Skiltaire by their creator. - Kunitsa's Jump 6 Radius - Will include links to maps, referee's notes, world notes, etc. Starships - Traders, scouts and warships of the Skiltaire and their neighbors. The Traveller game in all forms is owned by Far Future Enterprises. Copyright 1977 - 2003 Far Future Enterprises. Traveller is a registered trademark of Far Future Enterprises. Far Future permits web sites and fanzines for this game, provided it contains this notice, that Far Future is notified, and subject to a withdrawal of permission on 90 days notice. The contents of this site are for personal, non-commercial use only. Any use of Far Future Enterprises's copyrighted material or trademarks anywhere on this web site and its files should not be viewed as a challenge to those copyrights or trademarks. In addition, any program/articles/file on this site cannot be republished or distributed without the consent of the author who contributed it.